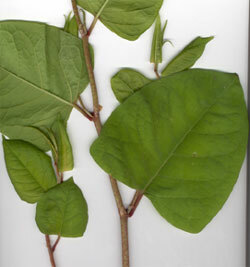 Japanese Knotweed is an important weed in several countries and has potential to become a serious plant pest in many parts of Australia. Plants recently found in Tasmania and Victoria were probably introduced as ornamental garden plants some time in the past. Japanese Knotweed is highly invasive and damaging to both the environment and domestic structures such as sheds, paving, brickwork and roads. Infestations in the United Kingdom are costing approximately £9M to treat over a three year period for each infestation site. More information on Japanese Knotweed will be provided in the near future. If you find this plant please call DPIWE as soon as possible on 1300 368 550. Do not remove plant material until a departmental Weeds Officer can provide assistance and management advice. Plant stems and root fragments can develop into new plants readily, easily spreading the problem to compost bins, waste sites and garbage tips.